Graham Bellinger - grahambellinger's JimdoPage! 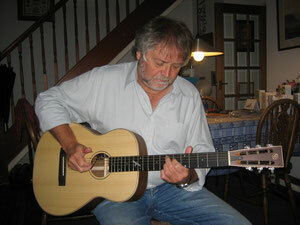 Graham has been performing at folk clubs and festivals for over 40 years. He has performed in community events, socials and parties and on local radio. He has played more pub gigs than he cares to remember and has composed and performed music for dramatic productions. Graham now performs mainly solo as well as with the Deportees which evolved from the acoustic rock and roll band Root Chords. He still finds time for gigs with the Deacons and with Ian. He is also a member of traditional singer Roy Clinging’s band, Steerage Class and part of an occasional musical partnership with Tom Doughty. This variety and range illustrates Graham's eclectic and open minded approach to repertoire and performance. Graham has also contributed to recordings by Bill Malkin, Roy Clinging, Ian Hankinson, Angie Wright, Phil Bradley, Julie Wright, John Warburton, Terry 'The Bear' Burgin and Vocal Point.